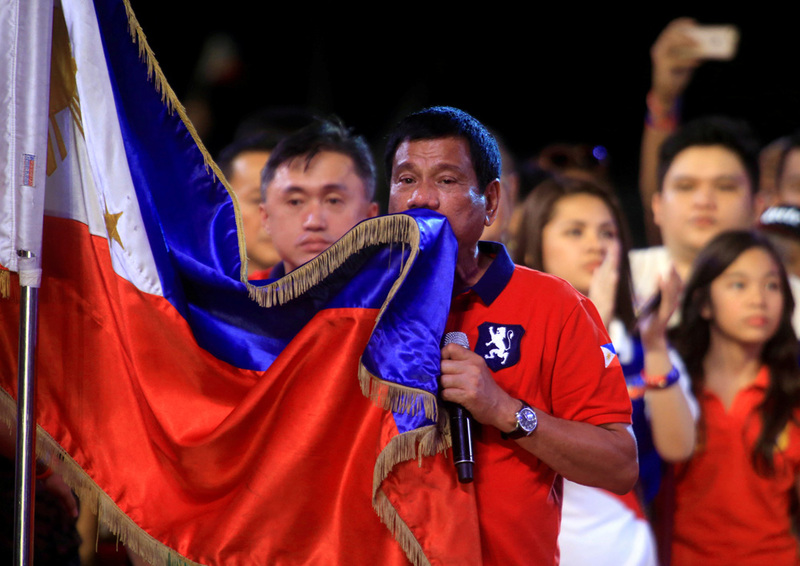 President-elect Rodrigo Duterte kisses the Philippine flag in Manila, Philippines. The results of a recent election in the Philippines might bring significant changes to the country’s domestic and foreign policies. This, in turn, could provide an opportunity for closer ties with Russia. On May 9, when all Russians were celebrating Victory Day, thousands of miles away the Philippines held a general election that had a dramatic effect on the political situation in the country. Voters chose 71-year-old leftist populist mayor Rodrigo Duterte, a member of the Philippine Democratic Party (PDP)-Laban. It appears that the combination of the growing degree of prosperity and a steadily high poverty level (about one-third of the population) played the decisive role in Duterte's victory. He will be sworn into office on June 30 for a term of six years. Will the American outpost hold? The Philippines may very well be the Unites States' most loyal ally in the entire Southeast Asia region. But until now, the leftists have never ruled the Philippines. Duterte's resolve to pursue independent foreign policy manifested itself during the election campaign, when he promised to engage in a new round of negotiations on the 2014 Visiting Forces Agreement signed between the Philippines and President Barack Obama's U.S. administration. The Philippine left perceives the agreement as a limitation imposed on the country's international, military, and political actions. During the Cold War, the Philippines were firmly under American control, so there is no long-standing tradition of Soviet-Philippine relations. Actually, diplomatic relations between Russia and the Philippines were established only forty years ago. Still, with Moscow's growing interest in the vast Southeast Asia region, having the populist President Duterte in charge of the country could provide the opportunity for the intensification of Russian-Philippine relations, even more so if the newly elected officials decide to reconsider their nation’s role as the second "unsinkable aircraft carrier" of the U.S. in East Asia. At least Russian Minister of Foreign Affairs Sergey Lavrov thinks that, "The Philippines has a lot of potential as Russia's partner in the Asian region." The two countries can work together as part of Russia’s general cooperation with ASEAN members. Judging by the winning party’s foreign policy rhetoric, under the new president, Moscow’s and Manila’s approaches to the resolution of East Asia crises (for example, the situation around the Korean Peninsula or territorial disputes) might converge. Objectively, there is also room for increasing economic cooperation, even though its actual levels are quite low. In 2015, total Russian-Philippine trade turnover amounted to just $0.58 billion, a significant drop from $1.4 billion in the year earlier period. Unfortunately, commercial exchange between the two countries lacks diversification, as the supply of oil and petroleum products accounts for 88 percent of Russia’s export to the Philippines. During the summer, the new administration - the most leftist government in the country’s history - will take over in the Philippines. Soon we will find out what will come of anticipated changes in Manila’s domestic and foreign policies, and if they might lead to an opening for Moscow.